As per Sthalapurana, Garuda performed Tapas to have the Darshan of Nrisimha of Vibhavathara. Granting the boon to Garuda, the Lord settled amidst the hills and dense forests in nine different forms mentioned above. Hence this holy hill is called Garudadri, Garudachalam and Garudasailam. It is also believed that the Lord killed Hiranyakasipu and saved Prahlada at this Kshetra. As Lord settled here forgetting even the Srivakunta, Mahalakshmi took avatar in the Hunter's family and married the Lord and hence called Senjulakshmi (Senju - Hunterfolk). There is temple for Prahladavarda at lower Ahobilam. Theertham - Indra, Nrusimha, Paapanaasa, Gaja, Bargava Theerthams. There is a cave temple on top of the hill about 6 miles from Ahobilam. The Moolavar here is Ahobila Narasimhar. The utsavar is Rama. As you climb further uphill along the banks of bavanasini you can reach the Varahanarasimha temple & further uphill on a steep hill Maalola Narasimhan gives darshan in a small sannadhi. It is believed that the pillar from which Lord Narasimha broke out can be seen two miles from this spot. The route to get the darshan of Jwaala Narasimhan & to reach these places, a guide is necessary. Alternately, you can reach here via Cuddapah, Arlegudda also. 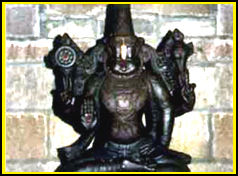 This kshetra is also known as Nava Narasimham. There are two divisions here. There are no regular poojas for seven of the Narasimhas. About 3 miles from here is the UkraSthamba in a very holy and sacred place. The Moolavar is Prahlaadavaradan, Lakshmi Narasimhan seen in seated posture facing east. The utsavar murtis - Maalola Narasimhar & 8 other murtis. Ahobilam is situated at a distance of 74 Kms from Nandyal (Kurnool District), around 365 Kms from Hyderabad and around 75 Kms from Tirupathi. Lots of transportation facilities are available. Bus facilities from Cuddapah, Nandyal and Banganapalli are available and frequent.